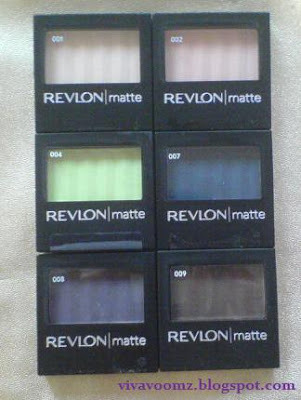 I purchased a couple of Revlon matte eyeshadows from Ulta.com during their Buy-One-Get-One-Free (BOGO) sale. These are from the Matte collection. For the longest time, I've been wanting these. It took me a while to get hold of them and I'm glad I got these. The packaging is really simple and neat, which I really like. It's not shiny so you wouldn't get your fingerprints all over. The eyeshadows are all matte. Colours are duller than presented in my photos. 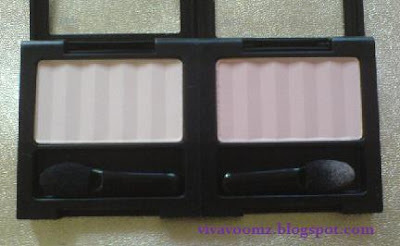 The powder is velvety smooth to the touch and pigmented when you swipe your fingers through it. However, they don't give you the pigmentation you want out of it when you swatched them. For light colours, you get a sheer, somewhat chalky colour out of it. For the dark colours, you get a not too sheer, but not highly opaque dark colour you wished for. 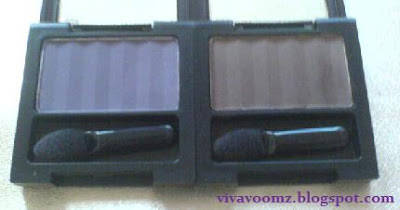 You get a dark smoked out shadow colour, but just not the full intensity of the colour you see. Vintage Lace is a light cream colour. It is my favourite out of the lot and I would definitely recommend this. It works awesome as a highlighter. The cream doesn't really show and it appears as a white with a satin finish (slight subtle shine) when you used it under the browbone as highlight. I really love it loads since it makes whatever eye makeup you had on, look more polished. Peach Sorbet is a soft peachy pink shade. It looks really yummy in the pan but comes off as chalky peach shade for me. I was planning to use it as an all over lid colour. It works and matches the darker eyeshadows from this collection well but I just don't really fancy it. Works well as a highlighter too if you don't like white/cream highlighters. Luscious Lime is a gorgeous bright lime green in the pan but was the most disappointing out of the lot. The colour payoff was really bad and it was just a very sheer, chalky and somewhat green shade which is not very noticeable. I wouldn't recommend this at all. It is a joy to look at this but it doesn't really work well despite trying all kinds of eye bases with it. Luscious Lime with Rich Sable is a lovely combo though if you don't mind a light and sometimes barely noticeable shade of green on the lid. Riveria Blue is a gorgeous dark navy blue. The colour is really pretty but colour is not that intensive unless you really pack it on with the sponge tip applicator. Great when smoked out. Aubergine is a very deep greyish plum. The colour is so dark and grey(duller than in photos) that you really can't tell it comes from the purple/plum family. I do not adore the colour on its own since it's so dull and dark and not purple but when I paired with other more vibrant purple eyeshadows, I changed my mind. It's pretty good as a darker crease colour. Rich Sable is a rich dark true chocolate brown. I really love this colour too because it smokes out really well. You can use this as a brow powder for your eyebrows too since it's matte and colour is buildable. 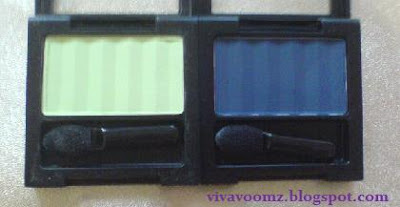 Overall, I enjoyed these eyeshadows although they don't sound easy to work with. Keep in mind these are not the eyeshadows you want if you want to buy something really pigmented and show up on the eyelids. The darker shades are really good for smoking out and the sheer application of "not so opaque" colours makes it very buildable. I had to ditch the NYX Jumbo Eye Pencil as eye base for this because these eyeshadows are hard to blend with NYX as bases. I had to use Revlon Illuminance Creme Shadow Quad as eye base to make them work. I also had some problems getting my eyeshadow brushes to pick up enough eyeshadows or blend properly. Such a pain to work with. I highly recommend to just use the sponge tip applicator when working with the darker shades as it's just easier. Pack on more layers of colours where you need it to be darker and a smoked out look can be obtained easily. The smoked out effect/look is pretty to wear when you don't want to go for a smokey look where you paint your eyelids completely black/blue/purple etc. You get gradations of darkness which I find it rather alluring and sultry. These are just some of my tips, I hope they work for you. I still think they are pretty good for matte drugstore eyeshadows since cheap matte eyeshadows are hard to find. Will be picking up the remaining colours like Tempting Teal (dark green shade) and Venetian Blue (dupe for MAC's Electric Eel) when I have the chance to.